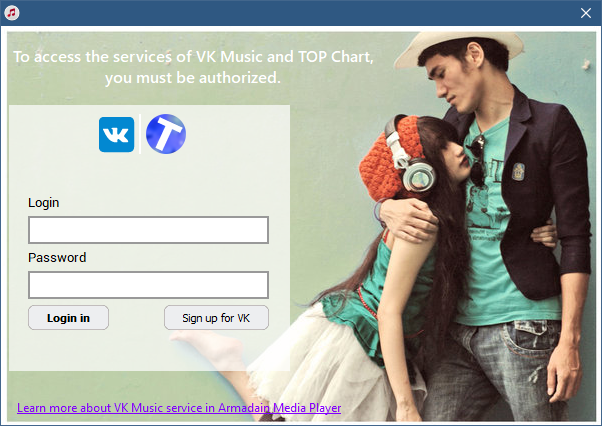 To access the services of VK Music and TOP-chart you need to login. Press the Universal Menu button and select VK Music or TOP-chart. You will need to enter your login and password. Enter your login and password. The Armadain Media player will log into your account. The computers do not store your login and password. The player only stores the token in an encrypted form. Armadain Media has access to your audio recordings, friends, groups, and to the status (for broadcasting audio recordings). To set up the Music VK service, click the Universal Menu> Settings> Stream> VK.